The Bismarck Tribune’s Amy Dalrymple’s wrote a good story recently about a marathon Little Missouri Scenic River Commission meeting. I’m going to write more about that later. I’ll just say, for now, be careful what you wish for. What I’m writing about now is one of the things the Commission discussed—the illegal bridge over the Little Missouri State Scenic River on the Wylie Bice Ranch in Dunn County. That study is underway right now, after a brief public comment period. What the BLM has done is required Mr. Bice to submit an application to build a bridge on their land (a bridge that already exists). He’s done that. Now they’re requiring an Environmental Assessment, which Mr. Bice will have to pay for. The Environmental Assessment could be done yet this fall. 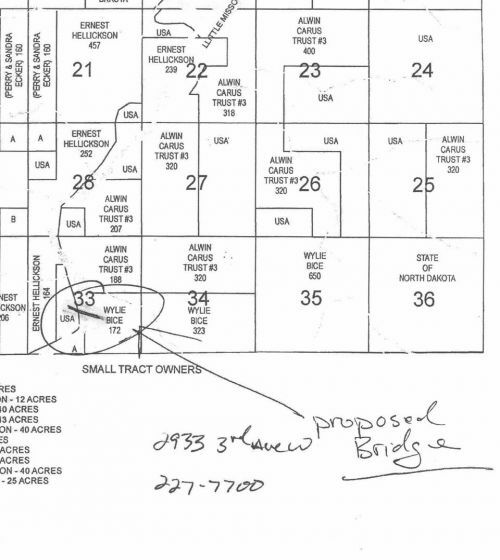 It will lay out a series of alternatives, which could include tearing down the bridge, or granting an easement and leaving the bridge in place, or a new option that just surfaced recently—selling the land the bridge is on to Mr. Bice. It’s only about 80 acres, and it’s isolated from other BLM land holdings in Dunn County, and it’s certainly worth less than $79.9 million, so Mr. Bice can afford it. In his application to the corps, Mr. Bice put in photocopies of two maps of the area. Both clearly show the land on the west side of the river is owned by the federal government. He even drew in the bridge on both maps, from his land onto BLM land. This map, from the Dunn County Atlas, with his note on the bottom showing the location of his bridge. There's a second map in the application, from the U. S. Forest Service's National Grasslands map, but I won't bother you with it. So it is pretty obvious he knew he was putting a bridge where he shouldn’t be putting a bridge, at least without permission from the people who owned the land. Still, the excuse he used for building the bridge where it shouldn't be, when questioned by the Tribune reporter, was that he thought he owned it. I did follow up with a phone call to the Corps lady, just to confirm. She said it was the responsibility of the person doing the project to contact the BLM. She said they assumed he had done that--it would only make sense to get permission before building the bridge. Well, after that exchange with the Corps, I called the BLM office and asked what the heck was going on. They were surprised. They said they'd get back to me. They did. With this response "Well, we've got a situation here." I actually really prefer Number 2, tearing the damn thing down, but it probably just doesn't make sense to do that now that it is there. I wouldn't mind if a lot of people suggested that, though. We’ll get a chance to comment on the Environmental Assessment and make our recommendations when it is done. I’ll let you know when that time comes.